Look closely and you just might see the rainbow swiss chard seedlings that we transplanted this morning into the greenhouse. We are crossing our fingers that these were not too small to transplant. 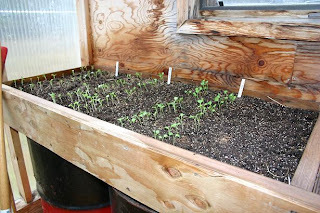 I found conflicting answers about when to transplant from a variety of resources, and being the impatient person that I am - I went with the advice that you transplant right after the true leaves start to show up. I think part of my impatience is coming from the fact that winter is almost here. On the mountain next to our house we can see that the snowline is only a couple hundred feet above us. In fact, I think we're going to have snow tonight. Then later this week we are forecasted to have night time lows in the single digits! 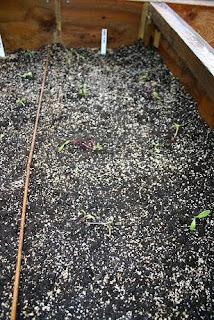 In the picture above are the radishes that we direct sowed about a week and a half ago. 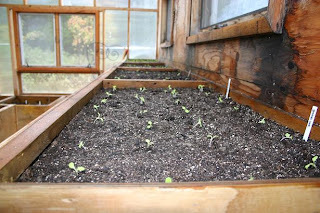 They are doing great and I just sowed another row of each type - purple globe, white globe and white icicle. These beds contain tom thumb lettuce, bibb head lettuce and arugula. Also started indoors and transplanted this morning. All of these seedlings had true leaves that have been showing for the past 2 days. Too early? We'll see. This critter is estimated to be the largest threat to the crops in the greenhouse. This is our 3 1/2 month old puppy Noah. He loves to eat dirt and almost took out our sprouting onions this morning when we weren't watching close enough! Gotta love puppies.